Faceniff is one of the most dangerous applications, it is the process of spying on the accounts on Facebook, by picking up the points of Wi-Fi on the Internet through the connection through Android phones, this application can access to all accounts Which is available on the phone freely, and helps to facilitate the process of espionage or hacking Facebook through the modern phone system Android, faceniff 2.4 has been developed to count many sessions of social networking sites. 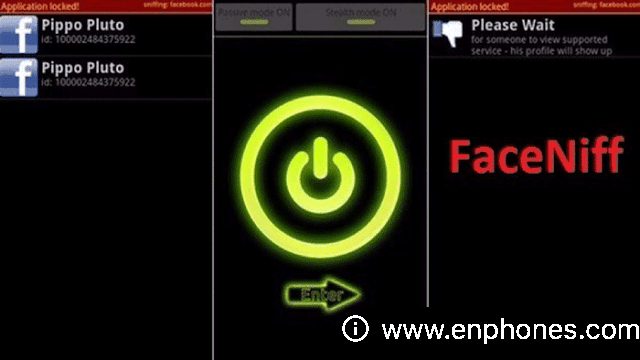 In this topic you find a simplified explanation of the most important features and characteristics of the faceniff application to pirate Facebook accounts connected with you in the same network, you can the application of stealing and thinking of the accounts of your friends on Facebook and get you with the click of a button, and also show you sorry link direct topic to download the application faceniff apk works Best and last free release. faceniff apk is used for security purposes. It helps you to know everything about your Wi-Fi network, you may be able to download the application on the phone and search for the people with you on the network and with one click you can access to their personal facebook, twitter page, Learn about all the pages you browse, which the user opens, and then you can add all your comments and posts, and also transfer audio and text files to your mobile phone. The browser must be careful about how to handle applications to surf Facebook and other personal accounts. It must activate encrypted HTTPS, which helps prevent theft. It can be activated by accessing the user's personal pages. The important HTTPS protocol has been developed to browse Twitter, YouTube, Amazon and other sites so that sites full of personal information are protected from abuse. He intervenes in the affairs of others by spying on his own property. The faceniff application controls the personal accounts accessed by the user by accessing the application and identifying the connected networks, and then selecting the network that is controlled and pressed, and then roaming within the phone and control all personal properties and accounts on the phone. This app supports the serious ability to control social networking sites for phones, Facebook, Twitter and many personal accounts. This application aims to spy in order to achieve security and control the emotions that occur in the region. Helps to know the crimes before they occur. The application helps the infiltration of many suspects, as well as controlling and arresting them as soon as possible. It is used to identify the weaknesses of internal networks in the region. The purpose of our talk about the application is not to encourage anyone to steal accounts; it is a warning to everyone to surf Facebook via encrypted HTTPS that you can activate by visiting your settings page. When you turn on FaceNiff, it searches for open Facebook sessions for people who are connected to you on the same Wi-Fi network. When you find them, you can just open their own page in your browser to find yourself on their page via their own account.